Sugar Busters! was originally self-published in 1995. With very little marketing, the book became a phenomenon. It was re-published in 1998 by a major publishing house, and has continued to be a bestseller. The diet is based in this – “Cut Sugar to Trim Fat”. Sugar (particularly refined sugar) is blamed for our fat problems. In a similar notion to the Glycemic Index, rise in blood glucose, and subsequent insulin production is blamed for weight gain. However where the Glycemic Index is an accurately measured scale, Sugar Busters is more arbitrary. All refined sugars are out; corn syrup, molasses, honey, sugared sodas, dextrose, glucose, maltodextrin, and beer. Also our are carbohydrates such as refined flour, white rice, potatoes, corn, and even carrots. The only carbohydrates included in the diet are stone-ground grains and high-fiber vegetables, and some fruits. Carbs allowed in small amounts are brown rice, oats, and sweet potatoes. The diet seems to balance at around 30% protein, 40% fat, and 30% carbs – although some say that carbs will be around 40%. An average days eating on Sugar Busters comes to about 1200 calories. This level of calories will produce weight loss in most people regardless of the macronutrient combinations! Sugar Busters claims that “Sugar is Toxic” and that calories aren’t necessarily the answer to weight loss. However there is nothing new in Sugar Busters. Banning foods like carrots is hardly a magic ingredient for weight loss. Carrots are high on the Glycemic Index, but how many pounds must you eat for it to make a difference? Sugar Busters works for many people, because by eliminating refined sugars, they are eliminating a significant source of calories… which leads to weight loss. 1200 calories may actually hurt weight loss in those that are very active as it isn’t enough calories to support both the activity and bodily functions. 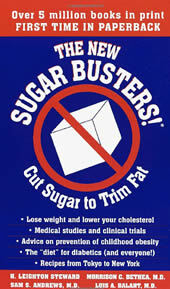 www.sugarbusters.com – Official homepage of Sugar Busters. The book retails for $7.99. Nor is there anything new in this article.